Q1: Study source 1. Is George Cruikshank a supporter or opponent of parliamentary reform? A1: George Cruikshank was a strong supporter of parliamentary reform. He shows MPs gaining wealth from their membership of the House of Commons. By including the corpses of the poor, he is suggesting that MPs decisions are causing serious problems for the people. Cruikshank is indicating that MPs were involved in a very corrupt system and this explains why they were opposing parliamentary reform. Q2: Why was the Duke of Wellington so unpopular in 1830-1832? How did the public show their disapproval of Wellington. It will help you to read sources 3-8 before answering this question. A2: The Duke of Wellington was the leader of the Tories and was against proposals to introduce reforms of the voting system. In source 8 he explained his view that "the conduct of government would be impossible, if the House of Commons should be brought to a greater degree under popular influence". Harriet Arbuthnot points out in her diary how the public reacted to Wellington's decision. They "hooted and hissed the Duke wherever they could see him" (source 3) and "feels that beginning reform is beginning revolution" (source 5). John Cab Hobhouse (source 4) reports that Wellington "was hissed, and hurt by a stone" after making a speech in the House of Lords against reform. In a letter to Harriet Arbuthnot, Wellington explains how a mob attacked his house and "broke about thirty windows" (source 6). In another letter he tells her he suggests "we shall have a revolution". He goes on to argue: "I have never doubted the inclination and disposition of the lower orders of the people. I told you years ago that they are rotten to the core" (source 7). Q3: Earl Grey (source 10), Thomas Macaulay (source 12) and Thomas Creevey (source 15) were all Whigs, who advocated passing the 1832 Reform Act. Use the sources to explain if this meant they supported universal suffrage (votes for all adult men)? If not, explain why the Whigs believed it was important for Parliament to pass the 1832 Reform Act. A3: The Whigs supported the idea of extending the franchise but were totally against the idea of universal suffrage (that was the demand of the Radicals in Parliament). Earl Grey (source 10) believed that by making minor changes to the electoral system Britain could avoid "annual parliaments, universal suffrage, and the secret ballot", the demands of the Radicals. His objective was "not to favour but to put an end to such hopes". Thomas Macaulay (source 12) makes a similar point. He is against universal suffrage: "It is not by mere numbers, but by intelligence, that the nation ought to be governed" and that he supports the Reform Bill "because I am sure that it is our best security against a revolution". Thomas Creevey (source 15) shares Macaulay's view that the proposed reform will prevent revolution and save the "monarchy from destruction". Earl Grey, Thomas Macaulay and Thomas Creevey all believed that once the middle classes had the vote they would end their support for reforms such as "annual parliaments, universal suffrage, and the secret ballot". Q4: Explain why some members of the House of Lords changed their mind about parliamentary reform between 1830 and 1832. A4: Most members of the House of Lords were strongly opposed to parliamentary reform. However, some changed their views when they became convinced that there would be a revolution if reform did not take place. Other Tories agreed to allow the Reform Bill to be passed when William IV threatened to create a large number of new Whig peers. Q5: Explain the meaning of source 14. A5: The cartoonist, John Doyle, shows William IV trying to keep his balance on the see-saw. However, the British people are giving their support to Earl Grey which is putting the Duke of Wellington at a disadvantage. 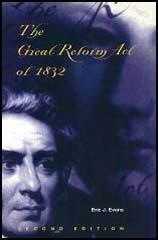 Q6: Why were so many people disappointed with the 1832 Reform Act? A6: Large numbers of working-class people took part in demonstrations, riots and acts of violence in an attempt to persuade parliament to enable all adult males to vote in elections. However, the terms of the 1832 Reform Act, meant that there were restrictions, based on the ownership and renting of property. As a result, only one in seven adult males had the vote. Nor were the constituencies of equal size. Whereas 35 constituencies had less than 300 electors, Liverpool had a constituency of over 11,000. The Reform Act rejected the idea of a secret ballot and therefore many people came under considerable pressure from their landlord or employer to vote in a certain way. The author of source 17 points out: "The overall effect of the Reform Act was to increase the number of voters by about 50 per cent as it added some 217,000 to an electorate of 435,000 in England and Wales. But 650,000 electors in a population of 14 million were a small minority".